Coffee Hot Tub!! I can have such a thing?! Very entertaining break from the Nicolle brothers. Its proof that girls can be just as awesome as boys when it comes to writing Axe Cop adventures. Good job Charlotte, Amelia and Uncle Lich King. Thanks for the fun story, guys. Also, your nieces are adorable–cute photo. And there was much rejoicing! Yaaay. 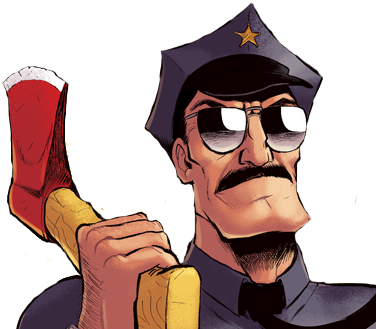 That was the best Axe Cop story I have ever read, the art style was Vibrant and Fun too, though the art and colors still make this style look familiar for some reason, its like I’ve seen this in a Fairly OddParents TV movie where Timmy Turner wish for a magical TV remote that would let him jump various Channel in their Diverse appearances, it almost reminds me of that Speed Racer parody where they started poking fun the EEE AH OOO AWWWW! and its that art style in Axe Cop: Revenge on Rainbow Girl looks just like that. And I’ve got a curious question for you Tom Martin, did you animate segments or draw storyboards for the Fairly OddParents back in the 2000’s? don’t get me wrong I like your art style I really do, its just… the art and colors look so familiar, especially those colors, I’ve seen those colors in Butch Hartman’s Cartoons, I can’t quite put my finger on it, where have I seen those Arts & Colors before? Hmmmm??? WhatEves, Congratulations to you and your nieces doing a spectacular job at writing such an Action Adventurous Feminine Axe Cop Story and to you for drawing such classic TV anatomy that reminds me of the DC 90’s especially that Kick #!$ moment where the bad guy grabs Dinosaur Soldier by the neck then Dinosaur Soldier shoots the bad guy below his chin, that was the best Axe Cop Moment ever! Thanks so much, man! I really appreciate the kind words. Never did anything on Fairly Oddparents or ever saw it, even. For the art style I was largely looking to Bruce Timm for guidance. For the colors, I have a weakness for candy-pastel palettes. I probably got wayy too saturated and bright throughout the story. We were just watching BAtman: The Animated Series last night! Had an interview with Timm at the end of the disc. Awesome work there, good choice of inspiration! I loved the whole thing.Thanks for entertaining us! And that’s the best family portrait ever. Important news: Fox is scrapping its ADHD block on June 28, so the animated series is probably cancelled. Amelia’s giving some serious Arya Stark vibes in that photo. I wouldn’t want to get on her hit list! Great job on this guest story, all three of you! Come! Join me in a cup of coffee, and afterwards, we can stroll around the grounds. I am a good guy who jut looks like a floting white hood and claok, but I am invincible, an suepr strong and fast, can fly, I can summon any weapon, and I have any power with the word “kenisis” at the end.